I hope this bright pop of colour is a welcome addition to your inbox today. I know it is a salad, and many of us – with rain either in progress (me) or threatening to do so – don’t feel terribly salady. But a splash of colour on a plate always cheers. And this one doesn’t contain lettuce, so with any luck those of you who only crave salads when you can also wear shorts will be tempted. Mind you, I never wear shorts but I can always eat salad. Go figure. Our sun-filled weekend spent labouring in the garden now seems rather far away. I haven’t sown any carrots this year, but my mint and parsley – used in this recipe – are already very happy with the very Scottish mix of sunshine and showers. That by the way is a euphemism for awfully wet but with an occasional peek of the Big Guy. At least I’ve stopped wearing a jacket. Indoors. Of course they are extremely nutritious. Carrots are blessed with not only an heroic amount of the antioxidant vitamin, beta-carotene but also vitamins K, C, Bs 6, 3 and 1, biotin, lots of fibre, potassium and numerous colour-related plant compounds that seem to nip numerous diseases in the bud. Here’s a great link to more nutrition information on this favourite veg. I like them because they taste great. Especially in this raw food recipe, which emphasises their natural sweet goodness. This is a super recipe to knock up and serve alongside freshly made hummus or other dips. We had a version of this for lunch today with Seven-Seed Spelt Bread, which also features in the main images on this page. today’s carrot salad – on steroids (taken on my phone) – loads of veg added, including beetroot, radish, avocado, cucumber and mixed leaves. But also some goats cheese, leftover quinoa and lentils too. But it is fantastic as a colourful, crunchy side to spiced grilled fish or chicken. Even a pomegranate-basted roast lamb. Basically anything vaguely Middle Eastern or Mediterranean can be eaten in its herbal, sweet company. I’ve given the recipe that I use for my cancer nutrition workshops, but I have suggested various add-ins that complement. Harissa, the North African chilli paste made with loads of spices, dried chilli, and olive oil, is a typical ingredient for this kind of salad – here is my recipe, using dried rose petals and other goodies. I like to keep it to a dod on the side to dip my fork into before I scoop up the salad. Have you been eating salads throughout the winter, or are you strictly a warm-weather salad nosher? What is your favourite year-round vegetable? Cinnamon is not standard in a Moroccan carrot salad. Nor is pomegranate molasses. 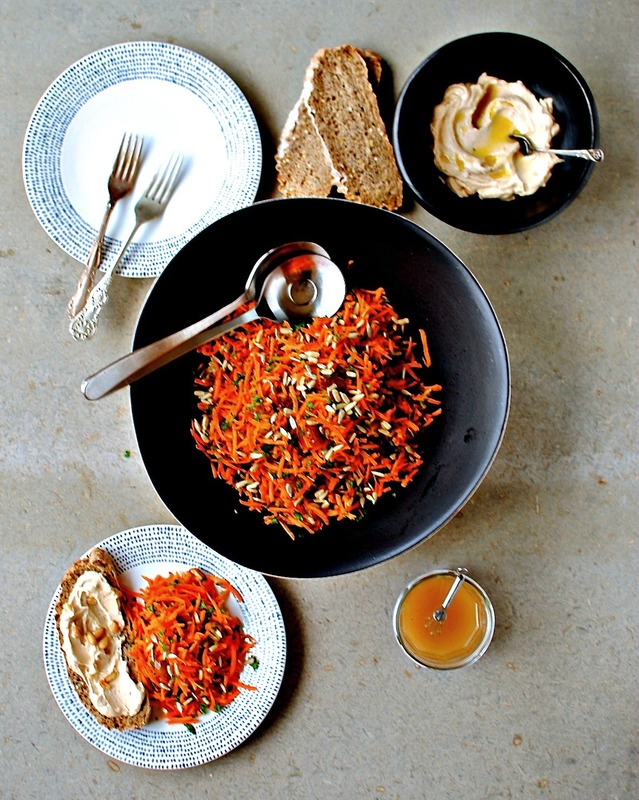 But the rest does evoke the salads you might be served in any Moroccan café or home. 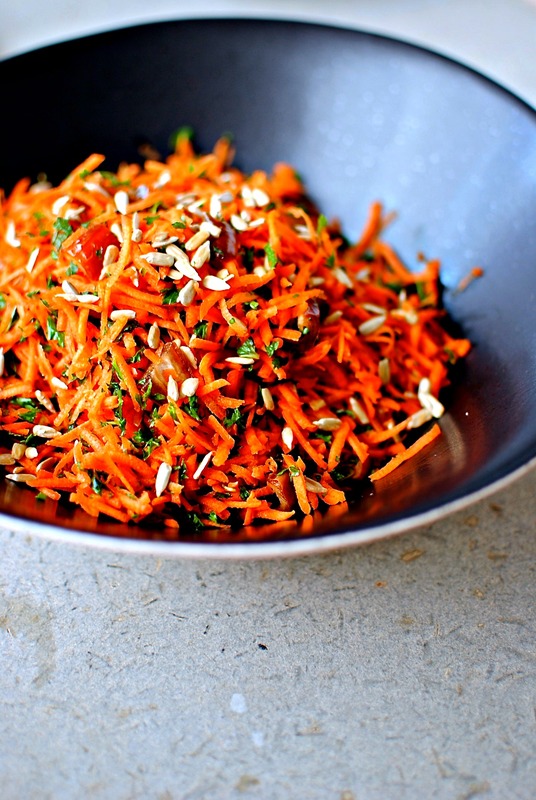 Like a lot of simple recipes and food ideas this carrot salad can be pimped and tweaked in many ways. I have given additional ideas. Let this be a template rather than a recipe. 1. Grate the carrot in a food processor or by hand. I like to lay the shreds in a clean tea towel and give it a gentle squeeze, but that’s not necessary. Pop the carrots into a large bowl, adding also the dates and sunflower seeds. 2. Mix the lemon juice, pomegranate molasses or maple syrup, olive oil, cumin, cinnamon and salt. I tend to just pour everything in a jar and give it a good shake. Pour this dressing over the salad and toss through with salad servers or just your hands – you can guess what I opt for. This salad will keep like this for a day or two. 3. Now roughly chop the herbs and add to the salad. Serve with hummus or other dips, good Arabic bread (this looks good), grilled fish or chicken – most anything you like. For a heartier salad to have on its own, I might add white beans or quinoa to this. And a good few pinches of soft goats cheese too. Enjoy! * basically just not the sugared chopped kind you get in the bakery section of the supermarket. These are nothing like the fat, almost caramel-like, dates I have suggested. Looks amazing! I have been singing your praises to as many people as poss and this will surely convince the that they should sign up to the mailing list! I feel a trip to the green grocers coming on…! Thanks so so much for your support, Helen. You have made my day! Such a fragrant salad! I picked up some plump, fresh carrots at the market and was just thinking about how best to show off their exceptional spring flavor. Your recipe arrived at the perfect time, thank you! What a lush looking salad! I am a big fan of salads here. Thanks to Elaine to get me connected to your space! What a lovely space you have here ! Thanks so much for stopping by, and for taking the time to leave a comment. Any friend of Elaine’s is always welcome. Wow this looks good. I’m glad I’m not the only person to use my phone for pictures too. my photography is greatly helped by it. 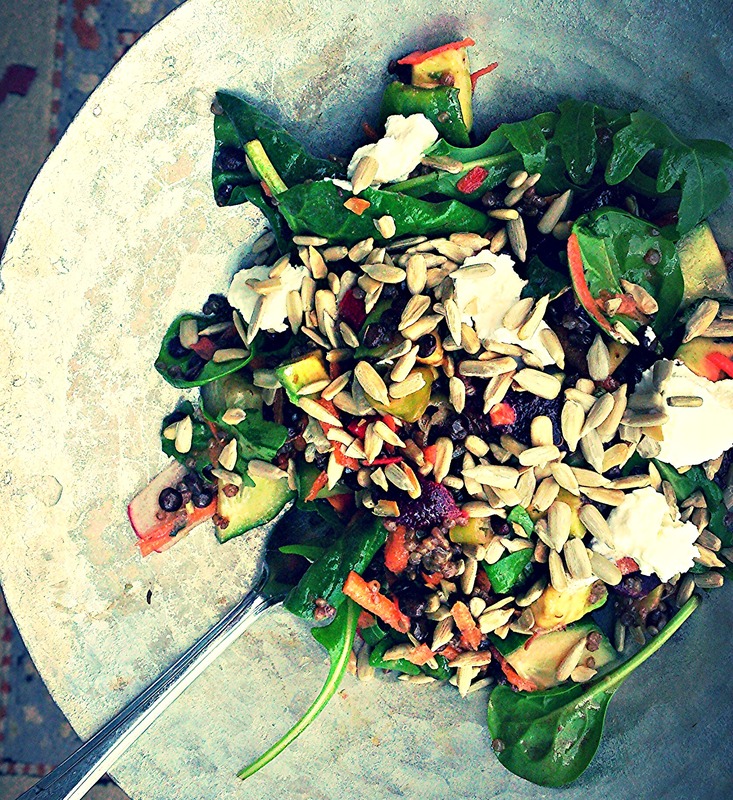 Lovely salad I too have been trying to enjoy sunny eating in this constant rain. I’ve got an Android phone, and the photo apps aren’t so great 🙁 But you get the ‘picture’ with this salad of what we ate today and how this basic idea can go so many ways. Stay dry! Think sun! Is there a sun dance, I wonder? I think they are still excellent images. All my blog pics are from my phone. I need to persevere with my camera. I’m hoping summer holidays and when my youngest goes to pre- school will all help! Enjoy your snuggles. More beneficiary than stomping I’m sure! Yes you are right and the time is already zooming by!! How did you know, I did need something bright in my inbox today. I make a similar Moroccan carrot couscous salad so I’m already in love with this salad. I definitely use carrots year around as well as sweet potato and avocado, although avocados are technically a fruit. Hope you see some sun soon again, we’re in the midst of rainy days here as well. I seem to have avocado everyday. I try and limit it to 1/4 of a fruit, but sometimes I can’t help myself, Katie. I bet you are far more disciplined! Well, if you say so ;-). Mind you, I’m much older, and my aged metabolism (which I could fix with HARD WORK) necessitates less of anything I love. Sadly. Kellie, I missed the Maggie’s Center video the first time around but just watched it. What a special resource for the community and a special mission to be involved in. Thanks for sharing this, I’ll keep my eyes open for them in the future. Thanks SO much Katie for going back and viewing it. I think it is really well done and demystifies what we do. So many people think a place for people with cancer is all long faces and whispered voices. The centre has space for sadness but it is more often than not ringing with laughter and people sharing experiences. Something for everyone at every stage of the cancer journey. Yes, that’s exactly the sense I got. An uplifting and spirited place for sure. That’s what I loved about it, and am happy to hear it’s starting to pop up in other places. Must have been a challenge but a great opportunity to learn what and how to cook for soft diets and other needs cancer patients have. Vibrant, nourishing and totally delicious, as always Kellie. Love it! What a wonderful salad, looks amazing. Never tire of soup or salad, there are so many different kinds. You’ve brought memories of a wonderful trip to Marrakech about 10 years ago to come flooding back! Lovely. what a lovely colourful salad. I enjoy an Indian version too which is lemon, cumin, chilli and salt with grated carrots but this one could be one to try in wraps with dips and other good stuff. Lovely video – what a nice centre you have there, and nice to see Mr A! Thanks for taking the time to watch the short video. The production team did a good job, I think. And so did Mr A 😉 Your Indian version of carrot salad sounds really good. I am shortly to post a carrot pickle that is along those flavour lines, but obvs we can’t eat it as a salad! I urge everyone to watch the film at the end of this blog, it’s a beautifully filmed calm no nonsense mini film about what Maggies can offer and why. If you are swithering or nervous about going, this will give you all you need to make that initial step through the welcoming doors and you will not look back. I always put cinnamon in my Moroccan carrot salad. Love the addition of the pom molasses! Try it Alyssa! And thanks for approving m cinnamon. I will have to quote you if I get in an argument with a Moroccan! Thank you, Sally. And I appreciated your very uplifting exchange with the great Diana Henry today. She is so down to earth, isn’t she? She’s absolutely lovely – and her food writing is stellar. I had tea at her house so met only briefly but she feels like a friend. I remember that you and some other lucky bloggers got to meet her at her house a couple of years ago(I love her bookshelves, groaning with books!). I was a wee bit jealous as I have long admired her writing and her attitude.But I was fortunate to have been introduced late last year by our mutual friend Hattie Ellis (What To Eat? writer – brilliant book) to help a little on her A Change of Appetite. We too have become friends. Such a lovely, lovely lady. Everyone who knows about her loves her too, it seems! And thanks for the flattering twitter banter with her yesterday. Nice to see all of that in print. PS I love your writing too. You have a fantastic style and I always look forward to your posts pinging into my inbox, Sally. Awesome! It is well-speedy to prepare, and makes tasty leftovers too. This looks delicious Kellie! Today is meal prepping day for me I will definitely try it ! I just recently started my own blog which has been a goal of mine for years, so I am passing on the link just in case you get some time to check it out 🙂 http://www.healthywithconfetti.com Hope you enjoy! 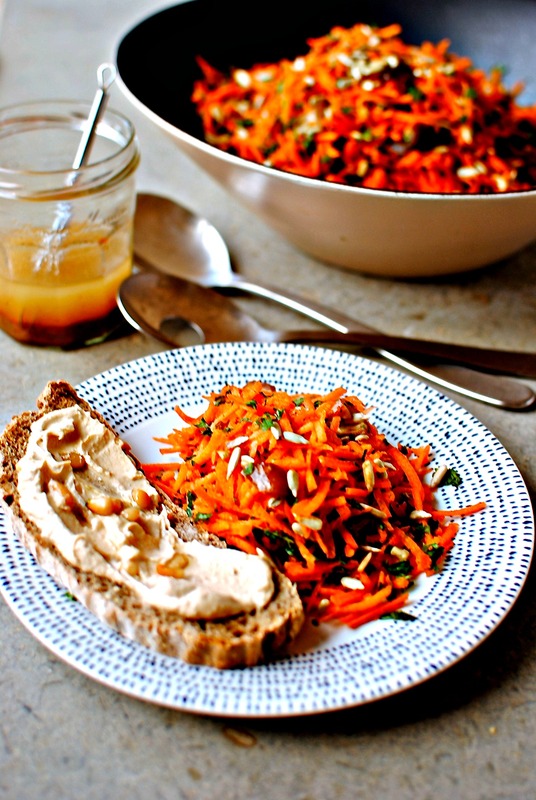 I’m sitting here eating hummus just wishing I had this carrot salad to go with it. Do you make your own harissa paste? I have done. And it’s good. But I also like el Fez (or something like that. You’ll know it) and Belazu. Do you make your own? I may blog my recipe because I suppose dome people can’t easily buy it. Thank you for such a lovely submission to NCR this month. The roundup is a bit late, but it is coming soon.